Difference between revisions of "Sword of Drynwyn"
Traditionally, the Sword has been guarded at [[Drynwyn's Tower]] by the elite Battleteam Drynwyn's Flame. The Sword of Drynwyn, often called Drynwyn’s Flame, is an ancient broadsword covered with a flame that lives of its own energy and requires no other fuel to burn. The hilt sports a Suubatar leather grip dyed jet-black, with a measure of eighteen centimeters, and a gold plated crossbar, with the design of a rising – or setting – sun on one side and a dragon on the other, perpendicular to the blade as a guard. The blade is exactly one meter and can deactivate a modern saber’s blade when it makes contact, showing that it is made of rare cortosis ore. On the side upon which the sun is engraved into the guard, a crescent moon made of a Sormahil Fire Gem is inlaid into the pommel. Inlaid on the other side of the pommel is a seven-pointed star made of a Jasse Heart, a gemstone from Baralou. Historians and scholars have found no hint of who the creator of this sword was, but because numerous items from various planets were obviously used in the creation of this weapon, it is believed that the crafter was extremely wealthy. The earliest known owner of the sword was Darth Nihilus, the Lord of Hunger, who had kept it a secret from even his closest advisers. However, it is believed that Nihilus passed the sword onto his Apprentice, Visas Marr, who discarded it when she was pulled away from the Dark Side. 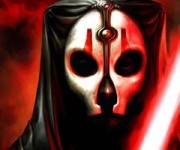 The sword passed through the hands of numerous owners, ranging from Sith Lords to curious vendors, and then reached the greedy, power-hungry fingers of Supreme Prophet Kadann. Kadann most likely hid the Sword somewhere on Bosthirda in his private stronghold, which was later raided by local mercenaries who sold it on the black market on Coruscant where it was bought by the New Republic. Approximately twenty years after Kadann discovered the Sword of Drynwyn and claimed it for himself, Acclivis Draco Quaestor, Annuvin, read a description of the sword in an ancient manuscript. He then dispatched a group of Dark Jedi to claim the Sword, who “appropriated” it from a New Republic research facility. Researchers believe that its power has been pulled from the Force-sensitive wielders of the sword. This is further backed up when more powerful Jedi hold the sword and the flame grows stronger and burns brighter. In very skilled and powerful hands, the sword can be made to project bolts of energy, making it a long distance, and mêlée, weapon. The bolts of energy are another mystery in that they range from a variety of colors, from a deep crimson to violet, and strengths depending on the wielder and the situation. Traditionally, the Sword has been guarded at Drynwyn's Tower by the elite Battleteam Drynwyn's Flame. This page was last modified on 20 January 2019, at 20:48.